Introduction: Primary Sclerosing Cholangitis (PSC) is a chronic cholestatic disease that results from the inflammation and destruction of intra- and extra-hepatic bile ducts and fibrosis which can lead to cirrhosis. 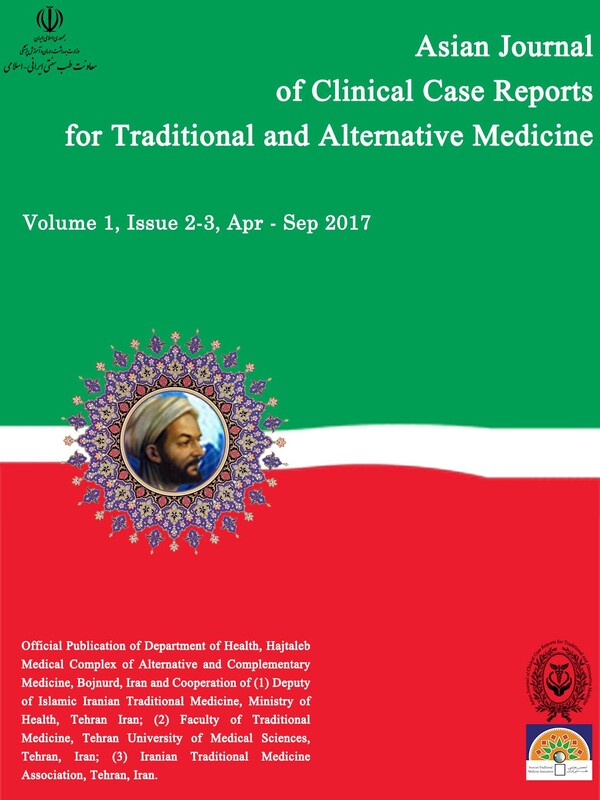 The purpose of this report is to provide the clinical experience of Iranian traditional medicine with the best therapeutic effect within the shortest time. Case Presentation: A 47-year-old man with a known case of IBD for 20 years and PSC for 6 years with severe pruritus, scored 7 based on a Visual Analogue Scale (VAS) and fatigue, but scored 8 based on VAS. The patient had depression due to the long duration of the disease, no certain treatments, and intense fatigue which impaired his daily activities. Laboratory tests prior to treatment revealed the following: ALT: 67 U/l (N: 5- 40), AST: 38 U/l (N: 5- 40), ALP: 683 U/l (N: 50-200), Direct Bil: 0.6 mg/dl, Total Bil: 1.4 mg/dl, Hb: 16.2 g/dl, and CA19-9: 86 U/ml (N: 0-40 U/ml). In the traditional medicine clinic, the patient was treated with health and nutrition improvement measures. The medications prescribed included a combination of herbal plants based on the patient’s disease. After 45days of treatment, the patient’s fatigue intensity, skin pruritus and feeling of depression reduced and he returned to an active life. Laboratory tests after treatment revealed: ALT: 44 U/l (N: 5-40), AST: 30 U/l (N: 5- 40), ALP: 520 U/l (N: 50-200), Direct Bil: 0.25 mg/dl, Total Bil: 1 mg/dl, and CA 19-9: 60 U/ml (N: 0-40 U/ml). Conclusion: Due to the patient’s physical and mental improvement, as well as significant improvement in symptoms, it seems that Iranian traditional medicine can successfully treat many common diseases. Primary Sclerosing Cholangitis (PSC) is a chronic cholestatic disease caused by inflammatory destruction as well as intra- and extra-hepatic biliary fibrosis which can lead to cirrhosis, liver transplant, and decreased life expectancy . In most cases, the disease is observed in men, but women and children may also be affected. This disease is most commonly found in people with inflammatory bowel disease (IBD) and ulcerative colitis, which could occur at the same time, before or after the bowel disease . However, in most cases, IBD precedes PSC . Bile duct stenosis and disruption of bile ducts travelling from the liver to the intestine lead to bile accumulation in the liver and cause pruritus, heaviness and jaundice, in advanced cases. Symptoms of inflammatory bowel disease, such as hematochezia, and abdominal pain may also exist. In some cases, the disease is asymptomatic and is revealed during routine liver tests . Since the etiology of this disease is unknown, there are no effective treatments for stopping or hindering the progress of the disease  but it is partially controlled with ursodeoxycholic acid. For pruritus, common anti-pruritus drugs are prescribed as adjuvant therapy. Calcium is also recommended in patients with premature osteoporosis. Most of these patients require a long-term, and lifelong treatment for their health. The treatment of intestinal disease should also be performed, if necessary . In mild cases, treatments are aimed at relieving the symptoms; however, the only certain cure is liver transplant .Therefore, low-cost strategies to improve symptoms through complementary medicine can improve treatment and the quality of life of patients. This study utilized an effective and inexpensive Iranian Traditional Medicine (ITM) treatment method to protect the health of the patient and to report it scientifically. The patient was a 47-year-old man with a known case of IBD for 20 years and PSC for 6 years. He was an employee, a BA graduate, residing and born in Tehran and weighing about 72kg with a height of about 180cm.The patient presented with complaints of pruritus, severe fatigue, and scleral jaundice. During these years, the relevant specialist administered anti-pruritic drugs to the patient but due to the long period of the disease, and lack of improvement in symptoms, the treatment was discontinued. The patient was referred to the traditional medicine clinic by a friend. The last medications the patient used included: ursodeoxycholic acid tablets (three times daily, and mesalazine tablets (six pills daily). The patient’s vital signs were as follows: temperature: 37°C, respiratory rate: 17 per minute, pulse rate 75 per minute, systolic blood pressure 115 mm Hg, and diastolic blood pressure 75 mmHg. The patient had severe pruritus with a Visual Analogue Scale (VAS) score of 7, and intense fatigue with a VAS score of 8. In the VAS method, a measuring device (ruler) with approximately 10 cm length is used with 0 indicating no complaints to a maximum of 10, indicating the worst experience so far. By specifying a number on the VAS, the patient enables the researchers to quantitatively measure and record an individual’s complaints The patient’s daily activities were also impaired, due to the prolonged disease, uncertain cure, and severe fatigue that caused depressed mood and depression. Laboratory tests revealed the following: ALT: 67 U/l (N: 5- 40), AST: 38 U/l (N: 5- 40), ALP: 683 U/l (N: 50-200), Direct Bil: 0.6 mg/dl, Total Bil: 1.4 mg/dl, Hb: 16.2 g/dl, andCA19-9: 86 U/ml (N: 0-40 U/ml). The patient did not use proper nutritional patterns as preventive and sanitary measures; in other words, he did not follow the advice of doctors as per prohibition and hygiene principles. The patient showed moderate weakness, and depression at the time of referral. From the viewpoint of humor, he had mainly cold and dry (black bile) humor, and a little hot and dry (choleric) humor due to his age, habits, and type of disease. From the viewpoint of traditional medicine, the patient was out of humor balance and was also physically weak, due to the disease. For this reason, the patient needed a physical regeneration and humor balance. In other words, the patient’s congenital humor was hot and wet (sanguine) and the current humor seemed more melancholic and choleric and induced the abusive nature of the black bile (cold and dry) and choleric (warm and dry) materials in the whole body. From the viewpoint of Health Essence (six principles of health) in Iranian traditional medicine, the patient did not have a good history and did not follow the principles of health and well-being. On palpation, the patient’s body was dry, and the pulse was weak and slow. In terms of mental health, he seemed depressed which in turn, resulted in the accumulation of black bile. The traditional medicine measures for this patient included health-preservation,and nutritional measures as well as the use of medicinal herbs. The patient’s treatment started on 23rd May 2016. In the first session, nutritional recommendations and six principles were provided to the patient, based on the diagnosis. Nutritional recommendations included being advised to avoid eating cold and dry (melancholic) foods as well as hot and dry (choleric) foods. Due to his weakness, he was advised to use rich foods, but at the same time, instructed to follow the six principles. Due to the humor and condition of the disease in this patient, medicinal herbs and combined drugs were used. Medicinal herbs were used as liver cleansers, and on the other hand, herbs were used to treat the disease, strengthen the patient, and treat depression. The most important drugs prescribed for 45 days for the patient were used in different conditions, and are as follows: whey protein, Chicory extract, Fumaria officinalis, and extracts of medicinal herbs including anise, thyme, jujube, and valerian, administered as liver cleansing agents. These drugs were prescribed to improve the patient’s humor, cleanse the liver, relieve obstructions, and decrease symptoms. Overall, the herbal treatment used for the patient was a complex, yet effective measure and the use of these herbs, in a single or combined form is very important and varies from patient to patient. With regard to treatment methods, the patient’s general condition significantly improved after a course of treatment and his fatigue intensity reduced from 8 to 2 (based on VAS) and skin pruritus from7 to 0 which in turn decreased the feeling of depression and returned him to everyday life. The results of laboratory tests after treatment are thus: ALT: 44 U/l (N: 5-40), AST: 30 U/l (N: 5- 40), ALP: 520 U/l (N: 50-200), Direct Bil: 0.25 mg/dl, Total Bil: 1 mg/dl, and CA19-9: 60 U/ml (N: 0-40 U/ml). PSC is a chronic cholestatic disease characterized by inflammatory destruction as well as intra- and extra-hepatic biliary fibrosis that can lead to cirrhosis . It is associated with multiple symptoms such as pruritus, fatigue, jaundice, and cholangitis. Currently, no suitable medicinal treatment has been discovered for this disease. Symptomatic treatments for reducing pruritus and other symptoms have been used in these patients. Liver transplantation is the only long-term treatment for patients. As a result, low-cost solutions to improve symptoms through complementary therapies can help increase the quality of life of affected patients which was the aim of this study. In this report, an attempt was made to use effective and inexpensive traditional medicine to maintain health, treat a patient and scientifically report it. From the perspective of traditional medicine, liver obstructions should be considered as a cause of PSC. Based on evidence from traditional medicine, liver obstruction and humor imbalance can play a role in causing diseases and the use of appropriate diets and medications can be effective on treatment strategies. Therefore, the knowledge of traditional medicine can help improve the health of patients. In this study, nutritional recommendations and six principles were recommended to the patient to help the disease process by familiarizing him with the principles of nutrition and traditional medicine. Iranian Traditional Medicine is used for the treatment of humor imbalance and by strengthening organs and tissues. In this study, herbs such as anise, thyme, valerian and jujube were used. In total, herbal treatment is a complex and (at the same time) effective procedure and the mixture of these herbs, alone or in combination is very important and varies from patient to patient. Studies on the efficacy of these herbs have been conducted in modern medicine. Several studies have revealed the antioxidant and hepatoprotective effects of whey protein and chicory [7-10]. In addition, some studies have been conducted on the effects of medicinal herbs such as Fumaria officinalis and anise on cleansing of the liver [11-13]. The antioxidant and hepato-protective effects of thyme have also been studied [14-15]. Studies have also investigated the positive effects of jujube and valerian on the liver [16-19].With the help of complementary medicine, we can move towards less complicated, cheaper, and more effective treatment options for PSC. Iranian traditional medicine, as a medical school, can provide effective clinical findings in treating and controlling the symptoms of some diseases, including PSC. The Iranian Traditional Medicine reduces costs and chemical medicines usage, and thus improves the quality of life in patients. Therefore, the principles of Iranian traditional medicine can be investigated and evaluated as a non-invasive new therapeutic method with utmost therapeutic effects in the shortest period of time. The author have no conflict of interest in the publication of this article. This article is the outcome of treatment measures by MSM and cooperated in documenting and writing the article. The author of the paper appreciate the cooperation of the patient and his family in providing the history and completing the treatment process. 1. Silveira MG, Lindor KD. Clinical features and management of primary sclerosing cholangitis. World J Gastroenterol 2008; 14: 3338-49. 2. Feld JJ, Heathcote EJ. "Epidemiology of autoimmune liver disease". J. Gastroenterol. Hepatol. 2003;18: 1118–28. 3. Talwalkar JA,Lindor KD. Primary sclerosing cholangitis. Inflamm Bowel Dis. 2005; 11:62-72. 4. Tabibian JH, Lindor KD. "Ursodeoxycholic acid in primary sclerosing cholangitis: If withdrawal is bad, then administration is good (right?)". Hepatology. 2014;60 (3): 785–788. 5. Lindor KD, Kowdley KV, Luketic VA, Harrison ME, McCashland T, Befeler AS. High-dose ursodeoxycholic acid for the treatment of primary sclerosing cholangitis. Hepatology. 2009;50: 671–673. 6. Trivedi PJ, Hirschfield GM. Treatment of autoimmune liver disease: current and future therapeutic options. Ther Adv Chronic Dis. 2013;4(3): 119–141. 7. Brieudes V, Angelis A, Vougogiannopoulou K, Pratsinis H. Phytochemical Analysis and Antioxidant Potential of the Phytonutrient-Rich Decoction of Cichorium spinosum and C. intybus. Planta Med. 2016;82:1070-78. 8. Soliman HA, El-Desouky MA, Hozayen WG, Ahmed RR, Khaliefa AK. Hepatoprotective effects of parsley, basil, and chicory aqueous extracts against dexamethasone-induced in experimental rats. J Intercult Ethnopharmacol. 2016;5: 65-71. 9. Drago-Serrano ME, Campos-Rodríguez R, Carrero JC, de la Garza M. Lactoferrin: Balancing Ups and Downs of Inflammation Due to Microbial Infections. Int J Mol Sci. 2017;18:501. 10. Abdel-Wahhab KG, Fawzi H, Mannaa FA. Paraoxonase-1 (PON1) inhibition by tienilic acid produces hepatic injury: Antioxidant protection by fennel extract and whey protein concentrate. Pathophysiology. 2016;23:19-25. 11. Gupta PC, Sharma N, Rao ChV. A review on ethnobotany, phytochemistry and pharmacology of Fumaria indica (Fumitory). Asian Pac J Trop Biomed. 2012;2:665-69. 12. Ozaslan M. A comparison of Fumaria parviflora Lam. and Momordica balsamina Linn. hepatoprotection. Pak J Biol Sci. 2011;14:1034-35. 13. Jamshidzadeh A, Heidari R, Razmjou M, Karimi F, Moein MR, Farshad O. An in vivo and in vitro investigation on hepatoprotective effects of Pimpinella anisum seed essential oil and extracts against carbon tetrachloride-induced toxicity. Iran J Basic Med Sci. 2015;18:205-11. 14. Vetvicka V, Vetvickova J. Essential Oils from Thyme (Thymus vulgaris): Chemical Composition and Biological Effects in Mouse Model. J Med Food. 2016;19:1180-87. 15. Horváthová E, Srančíková A, Regendová-Sedláčková E, Melušová M, Meluš V, Netriová J. Enriching the drinking water of rats with extracts of Salvia officinalis and Thymus vulgaris increases their resistance to oxidative stress. Mutagenesis. 2016;31:51-9. 16. Thirugnanasampandan R, Ramya G, Bhuvaneswari G, Aravindh S, Vaishnavi S, Gogulramnath M. Preliminary phytochemical analysis and evaluation of antioxidant, cytotoxic and inhibition of lipopolysaccaride - induced NOS (iNOS) expression in BALB/c mice liver by Ziziphus oenoplia Mill. fruit. J Complement Integr Med. 2017;14(2): 20160009. 17. Kandimalla R, Dash S, Kalita S, Choudhury B, Malampati S, Kalita K. Protective Effect of Bioactivity Guided Fractions of Ziziphus jujuba Mill. Root Bark against Hepatic Injury and Chronic Inflammation via Inhibiting Inflammatory Markers and Oxidative Stress. Front Pharmacol. 2016;7: Article ID: 298. 18. Rajopadhye A, Upadhye AS. Estimation of Bioactive Compound, Maslinic Acid by HPTLC, and Evaluation of Hepatoprotective Activity on Fruit Pulp of Ziziphus jujuba Mill. Cultivars in India. Evid Based Complement Alternat Med. 2016; 2016: Article ID: 4758734. 19. Kakehashi A, Kato A, Ishii N, Wei M, Morimura K, Fukushima S. Valerian inhibits rat hepatocarcinogenesis by activating GABA(A) receptor-mediated signaling. PLoS One. 2014; 9: 113610.